Playoff Shirt!! It’s Duck Season! It has Benn far too long since we got to celebrate the playoffs. There is nothing for the intensity that is the NHL playoffs. 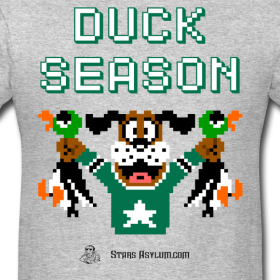 To celebrate our 1st round series against the freaking Ducks, we have made a Duck Season shirt. Like all our shirts it is available in men’s, women’s, and kid’s sizes. They are available NOW, just visit our store HERE.